Downtown San Diego is one of the most dynamic metropolitan areas in the country, drawing both visitors and residents to a sophisticated city center. Framed by inland mountains and a beautiful natural harbor, downtown San Diego’s alluring cityscape is a testament to years of redevelopment and urban revitalization. 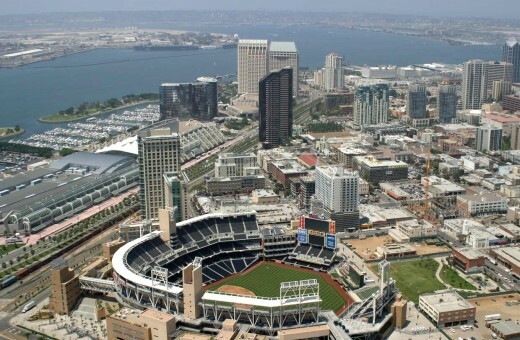 Downtown San Diego is composed of eight distinct neighborhoods – Columbia, the Core, Cortez Hill, East Village, Gaslamp Quarter, Horton Plaza, Little Italy and Marina – each with their own personality and allure. • A small, lively bistro, Café Chloe offers light French fare with substantial breakfasts, svelte lunches and dinners and sophisticated bar-nibbles.• The Fleetwood serves up a menu of modern American dishes against a backdrop that marries an upscale sports bar with a chic lounge. Nightlife• The luxury Andaz San Diego boasts popular hot spots like Ivy Rooftop, a sultry rooftop lounge with a swimming pool, swinging chairs and beds, and Envy, a two-level underground lounge. • Hotel Solamar’s LOUNGEsix is a rooftop oasis where visitors sip fresh fruit cocktails and lounge by a sparkling pool and roaring fire pits. In the historic Gaslamp Quarter, consisting of 16 ½ blocks around Fourth and Fifth Avenues, grand Victorian-era buildings are home to more than 100 of the city’s finest restaurants, 40 bars and nightclubs and 100 retail shops, as well as theaters, art galleries, offices and residential/work lofts. When the sun sets, this downtown neighborhood attracts thousands of diners, shoppers, theatergoers and nightclub patrons. • Marble Room offers a unique menu of California Tapas-style cuisine and innovative selections that are seasonal, delicious and adventurous. • Croce’s Restaurants and Bars, established by Ingrid Croce as a tribute to her late husband ‘70’s singer/songwriter Jim Croce, is a local landmark combining live jazz and fine dining for more than 20 years. • FLUXX, a high-energy dance club, opened in March 2010. The venue incorporates organic décor amidst bright, bold colors and playful design elements including a large-scale adult three house, a 15-ft. custom rope chandelier and eye-catching art. • Opened in May 2009, Syrah Spirit & Wine Parlor is a subterranean hideaway that evokes an Alice in Wonderland setting look and feel. Syrah offers hand-made cocktails, unique beers and a diverse wine list. • The San Diego Zoo is more than a zoo: it is a sanctuary for thousands of animals, a landscape of rare plants from all climates and a living classroom that entertains as well as educates. • Seaport Village, a 14-acre waterfront shopping, dining and entertainment complex, recreates a California harbor setting of a century ago with four miles of meandering cobblestone pathways, ponds, fountains, lush landscaping, 57 themed shops, restaurants and cafes. • Balboa Park covers over 1,200 acres and is minutes away from downtown San Diego and has over 85 cultural and recreational organizations, including fifteen museums and various performing arts groups, including the world-famous Old Globe Theatre. • The USS Midway Museum invites the public to learn about America’s longest-serving aircraft carrier with 35 exhibits and tours exploring its rich 47-year history. Many of the story-telling docents are veterans who served aboard the carrier. • The floating Maritime Museum of San Diego features one of the finest collections of historic ships in the world, including the Star of India, the oldest active sailing ship. • Celebrate the wonders of the sea at SeaWorld® San Diego. Experience the all-new Shamu® show, One Ocean, and thrilling rides like Journey To Atlantis®. Get up-close to beluga whales, polar bears, sharks and penguins. And experience the amazing world of the sea turtle in the brand-new Turtle Reef. This entry was posted in Insider Tips by Suzzanne. Bookmark the permalink. I just found out about this new business in San Diego (by a San Diego Mom) that caters to Local SD businesses (nice to support our own community), thought you might want to pass this new website on to San Diegans, great for new combers to San Diego too! (great book offer right now!